Das ursprüngliche Orginal kann das im Besitz von Großherzogin Augusta von Cambrigde sein, bzw zeitgleich, hatte Königin Therese von Bayern, Pss of Saxe-Hildburghausen 1792-1854, verheiratet seit 1810 mit LUDWIG I, König von Bayern 1786- 1868, ein fast identisches Exemplar. 1825 gefertigt, warscheinlich von Kasper Rieländer, München, dem Hofjuwelier der Bayrischen Könige und Wittelsbacher. Sie schenkte es ihrem Sohn Prinz Otto, dem späteren König von Griechenland, er heiratete 1836, Amalie von Oldenburg 1818-1875 siehe oben im Bild. Die bayrische Version hatte herrliche 16 grosse Perlentropfen hängend in den diamantbesetzten Bögen, sowie 16 nach oben als Zinnen stehen befestigt sind, unterbrochen von diamantbesetzten Schlaufen, den sog. Liebesknoten. Oben links ein Ausschnitts des Gemäldes von Lorenz Kreul, aus dem Jahr 1826 der bayrischen Königin mit dem Diadem. The first diamond tiara above, the bavarian version is consisting of 16 diamond arches with pearl drops hanging from lover's knot bows, topped with pear shaped pearls. 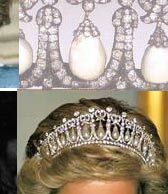 In Geneve in May 1981, Christies offered for sale a pearl and diamond tiara with a varied and eventful history. It was originally part of the trousseau of Princess Auguste von Hessen-Kassel, who in 1818 married Adolphus, Duke of Cambridge, the senventh son of the British monarch Georg III. 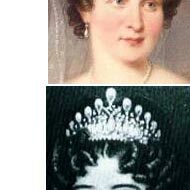 In 1838 the Duchess of Cambridge, as she had become, wore this particular tiara at the coronation of Queen Victoria in Westminster Abbey. 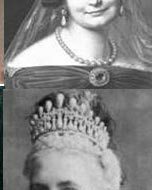 The tiara was later given to the Duchess`s daughter, Princess Auguste Caroline, on the occasion of her wedding. 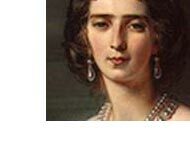 Thus it came into the possession of the family of her husband, Friedrich Wilhelm, Duke of Mecklenburg-Strelitz. 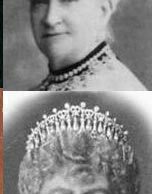 After her death, the tiara was inherited by her Granddaughter Jutta, Princess of Mecklenburg-Strelitz. The Tiara was sold for SFR 280 000 in 1981. 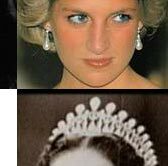 Interestingly, at least four other tiaras of the same pearl and diamond design are known to have existed, so in November 1985 an almost identical tiara was sold by Christies`s in Geneva for SFR 462 000. Perhaps the best-known example, however, is the one kept by the Residenz Museum in Munich. This tiara is attributed to Caspar Rieländer, the famous Munich court jeweller,and dated ca 1825. 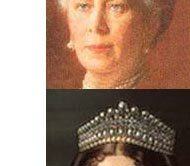 The Tiara of the Princess of Waldburg-Zeil (Princess of Bavaria) is by comparsion of the image, not the bavarian tiara, the bavarian version, is smaller by the pearls, but identically by that of the Mecklenburg. 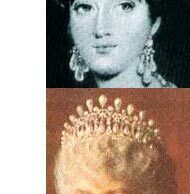 And of course the most famous, of these tiara ordered by Queen Mary from Wolff, set with brilliant and rose cut diamonds and pearls. Originally there were 38 pearls, 19 hanging down and 19 shooting straight up above each lovers knot, which were detachable. Picture above. 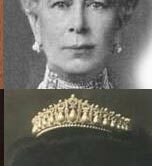 Queen Mary wearing the Lover's Knot tiara as it was made for her by Wolff and later from Garrard (diamonds changed from original small pearls) in 1913 with all 38 pearls. More recently, this tiara was given to Diana Princess of Wales on her marriage in 1981. 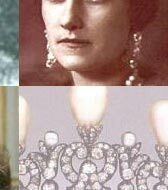 The pearl tiara of the Princess Maria Immaculata Princess of Saxony, nee Princess Borbon -Parma, there are only pictures of the princess with the hanging 19 pearls, we don`t know if there was more pearls for the spikes. 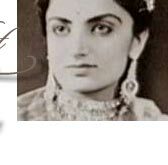 She wore this jewel on some occations of the family, on top a smaller round pearl. 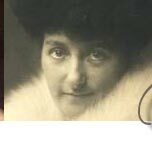 The princess died childless in 1947 at Swiss, 9 years after her husband the Prince of Saxony, a great art-collector and brother of the last King of Saxony. Yet another verson, belonging to the Russian Yousoupov family, was unearthed in a secret cache by the Bolsheviks in 1925. It has not been seen since see link below.